It was this very book that helped us to win a bottle of Champagne at the Beacon Island Hotel in about 1983. Dinner was over, the band was on a break, and the entertainment manager was doing his duty by hosting an impromptu quiz. The final question, for a bonus bottle of Champagne, went as follows: “Every year, Madame Tussauds in London polls its visitors to discover who they think are the most feared or hated people in history. What were the most recent poll results?” My brother and I instantly broke into wide grins – this was one of the lists in the book, the book we had both read so often that we could quote vast tracts of it on demand! Papers were handed out, pencils chewed and answers handed back, and then finally, the winner was announced: “And the winner is… Anton from room 42. Where is Anton?”, called the entertainment manager, waiting for a suave, well-travelled gentleman to appear. Instead, my brother, not yet in his teens, ambled over to initial surprise and then big applause, collected his Champagne, and sauntered back to the table. I can no longer remember all five people on the list (I know Adolf Hitler, Genghis Kahn and Dracula were on it – possibly also Richard Nixon!) – but I do know that if the Book of Lists authors had decided to compile a list of the 5 most hated vegetables in the western world, it is almost certain that Brussels sprouts would have topped that list. In repeated surveys over the years, it has topped polls of most loathed vegetables in the UK and USA, having knocked spinach off the top spot after Popeye somewhat rehabilitated its image in the 1930s. Evidently, the only thing that has a slight edge over Brussels sprouts in kids’ surveys is aubergine. Fact. I guess I am lucky – my mom never made Brussels sprouts for us as kids (possible because my father was an ardent vegetable-dodger his entire life!) so I never developed a childhood dislike for them. When she did start serving them, I was already a teenager and the microwave had been invented (! ), so I never had to contend with sulphur-smelling waterlogged soggy sprouts. To me, they have always been like delicious little mustardy mini-cabbages – which is in effect what they are – and I am endlessly on the lookout for new ways to serve them and convince the sprout haters. 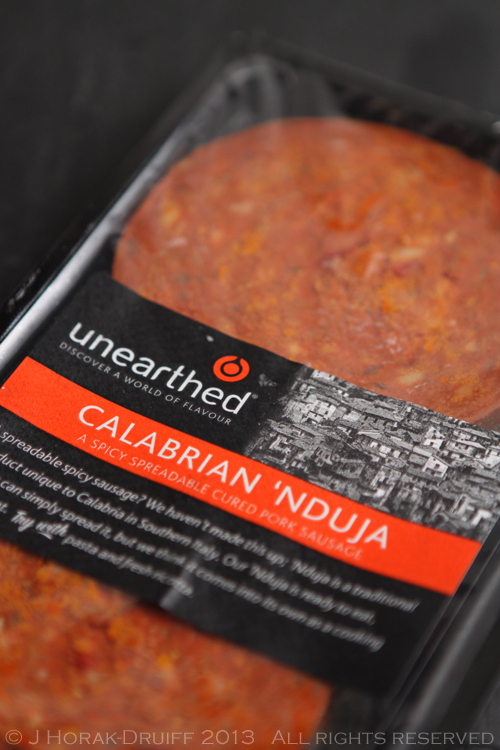 Last week a survey of things in my fridge that needed using up included a bag of sprouts and some Unearthed nduja, a soft, spicy, spreadable Italian sausage considered one of the most famous typical foods from the southern region of Calabrian. It is typically made with ground pork including the shoulder, belly and jowl as well as tripe, kneaded together with salt and Calabrian chili pepper, stuffed into natural animal casings. The sausage is then slightly smoked and allowed to rest and season for a number of months. Unlike salami, nduja is made to a very soft, spreadable consistency, and the hot, smoky chilli flavour makes it unlike any other Italian cured sausage you may have tasted – closer to a soft chorizo than a salami. I figured bacon goes well with sprouts and inspired by this recipe, I thought nduja might too – it’s just piggy goodness in a different form. The combination of slightly crunchy sprouts, melted nduja and the heady spice of the chillies made for a fantastic dish, lifted by the zingy addition of some chopped preserved lemons. 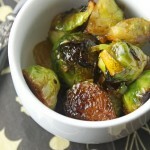 Definitely something for the list of CookSister’s Top Five Brussels Sprout Recipes! The combination of nutty sprouts and spicy nduja sausage in this recipe makes for a surprisingly delicious combination - serve as a side dish or add cubed potatoes for a substantial vegetarian main course. Trim the Brussels sprouts and cut each one in half vertically. Heat 3 tbsp of the olive oil in your widest frying pan and place the sprouts cut side down in the oil in a single layer (you may have to do them in batches, topping up the olive oil between batches). Saute over medium high heat until the sprouts start to caramelise (you will smell them). Carefully turn them over and continue to cook until the other side also starts to caramelise (another 4 minutes or so). One all the sprouts are cooked, decant into a bowl and keep warm. In the same pan, heat the remaining tablespoon of olive oil and add the onion. Sautée for a few minutes until they start to go translucent, then add the garlic and the nduja. Stir to break up the nduja - you will see how it "melts" into the onions. Add the sugar when the nduja is all melted. Return the sprouts to the pan with the nduja and stir to ensure that the sprouts are evenly coated. Add the chopped preserved lemons, mix well and serve. Oh, man. 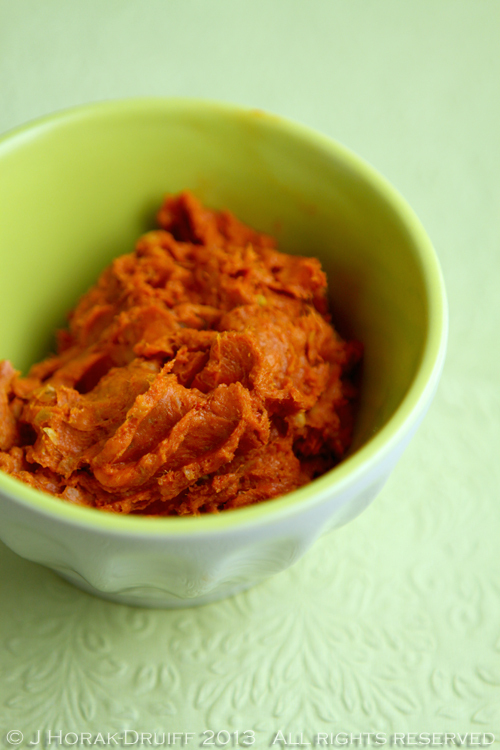 We love ‘nduja here, but we can’t get our hands on it easily in Belgium. (Heh, another excuse to go to Italy.) I may just have some, though, in the pantry…this is the perfect thing to do with it. I’ve always loved sprouts! I like lists but men seem to be obsessed by them (High Fidelity by Nick Hornby). I’ve always wanted to taste nduja, but I have never seen it here (Switzerland is not very modern when it comes to food)… This combo is simply awesome and totally to my taste. Hmm, doesn’t surprise me brussels sprouts have a pretty bad image but what does surprise me is eggplant! I would not have thought they were so reviled. Wow! 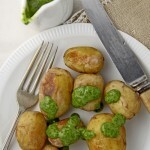 Finally, a delicious way to cook one of the most disliked vegetables in the world. Ooooh I love this post. I keep compiling my own list of Top Five Favorite Posts Written by Jeanne and it changes almost everytime I visit! This is great! And I never knew Brussel Sprouts as a kid and maybe the first time I really ate them was when my brother showed me how to steam them to pefection and I fell in love. Your recipe looks outrageous! And nduja? Never heard of it! But I would so eat a bowl of this! Hey! Thanks for the shout-out! Very enjoyable post. Brussels sprouts and ‘nduja and preserved lemons sound just about perfect to me.